The London commute is a trying and stressful adventure for many of us. Travelling in to London or across it, rail is frequently the only viable option, and so we’re at the mercy of it every day. The alarm clock in the morning is the ‘starting-gun’ for the race to work. The first leg of the race is to be at the opportune place on the platform ready to commandeer a seat on the arriving train. It is a mundane task, though occasionally the monotony is broken when you discreetly chuckle to yourself at the sight of the late-comers making a frenzied dash to the platform. Once on-board, you make a firm stride towards your chosen seat (god forbid somebody should be already sat there). And now, the race takes an awkward pause. You sit there for the next 45 minutes or so, having your personal space being violated by the overcrowding, and the irritating sound of the music blaring from the selfish twit opposite you. It isn’t pleasant. Later, out of the dull background hum, you hear the train conductor’s voice interrupt for his ‘underground update’. You sit upright as it indicates we’ll soon be arriving into London Waterloo and the second leg is about to start. 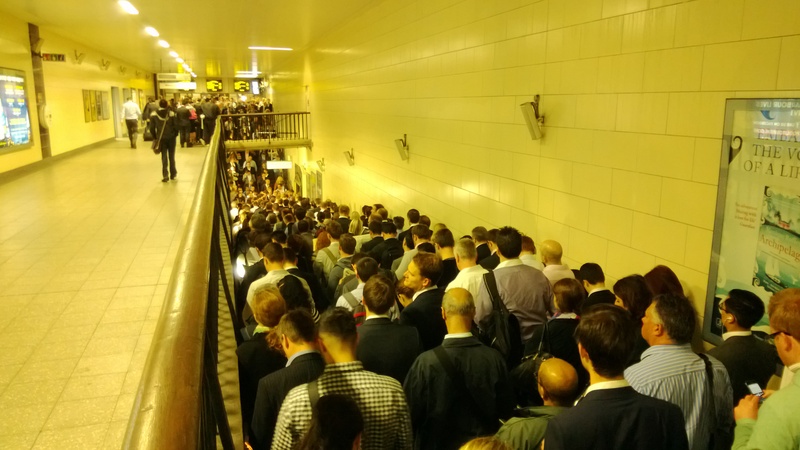 He announces, “delays only on the Waterloo & City line!” Whilst others around you breathe a sigh of relief, you quickly give no quarter to their concerns and think: “Damn it!” That was the line you were planning on taking to your next important appointment. Your blood pressure has risen, your heart rate increases, shoulders have become tense. You are now stressed. You cannot afford to lose time with things going wrong today. Helplessness is what aggravates you the most. The predicament you cannot control. Your travel strategy has just been torpedoed! So, just like in any other strategic decision, you go through a cycle of; analysing – choosing – implementing. The analysis has just been done, but only partially by the train conductor mentioning the ‘delays’. You are basing your decision on a perception of a word. You haven’t seen it for yourself and so cannot make a better judgement or indeed analysis over its severity and therefore how much it really does affect your original ‘travel strategy’. It would be helpful to have the right information now so you can make a decision before you arrive and see the delays for yourself. This is exactly where Shnergle can help. Shnergle allows users to ‘recce’ (short for reconnaissance) a place before they arrive, by providing time-stamped and geo-tagged images. It helps you make the decision before you physically arrive there and see it for yourself. Although this video has used the pubs & clubs scene to mainly demonstrate the apps use, the concept is so easily applied to commuting as well. For instance, you may see the image that’s at the top of this blog post on the Shnergle app, and notice it was taken 5 minutes ago at the Waterloo underground for the Waterloo & City line. You can make your own analysis of the image and you may choose an alternative option (by taking instead the Jubilee and the Northern line). So, when you arrive at Waterloo you are ready to implement your revised travel strategy and save yourself a heap of time by not getting caught up in the delays. Wouldn’t that regain some control when things go wrong on your commute?